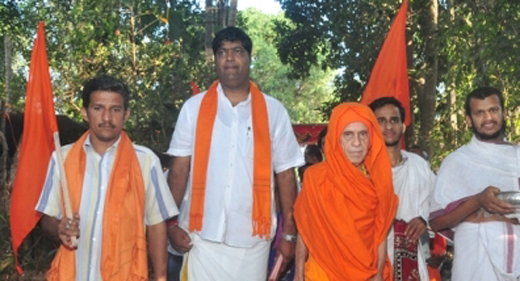 Udupi, Mar 6, 2015 : Sri Vishwesha Theertha Swamiji of Pejawar Mutt who visited the Dalit Colony at Nittur on March 6, Friday and spoke to the residents of the colony, has later made it clear that there was no political motive behind his visit. The seer interacted with the residents and gave a patient hearing to their problems. His visit also aimed at mobilising support for the Virat Hindu Samajotsava scheduled to be held in Udupi on March 9. Speaking to reporters, the seer said his visit aimed at sensitizing the public against the evil practice of untouchability. At the same time, he said that he was aware of the fact that the practice which still prevails at some places, cannot end merely by visiting a Dalit colony. He also recalled his earlier visit to the Nittur colony two decades ago. On the Pankti Bedha row revolving around Udupi Krishna Mutt, the Pejawar seer said he was in favour of equality while serving food in temples. Simultaneously, the seer said he cannot impose any rule on Brahmins regarding the same. Shockingly, the seer opined that he was not in support of inter-caste marriages which he said does harm to the caste system. The Hindu dharma can develop when the deprived sections in the community achieve progress, he further stated. The seer visited various houses in the colony. VHP Udupi District Chief Baikady Suprasad Shetty and others were present.